Digimation’s Visible Weapon™ is designed to augment live-fire instruction by familiarizing students with the mechanics of a weapon including its individual parts, function, and cycle of operation. Using realistic 3D graphics and interactive animation, the Visible Weapon series communicates information visually in a way that stimulates learning and improves comprehension and understanding. Using the Visible Weapon’s innovative Parts Explorer, individual parts can be visible, hidden, or rendered in x-ray mode. 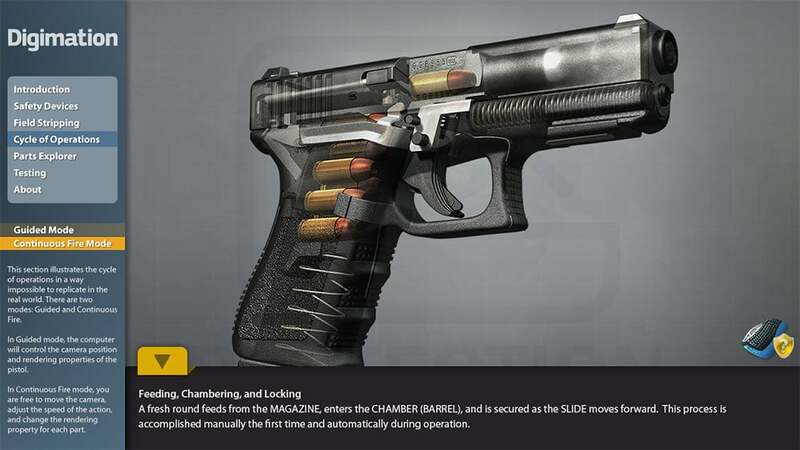 This allows users to customize their view in a variety of ways that reveal the inner mechanics of the firearm in a way impossible to do in the real world. The cycle of operations shows the precise movement of each part during the firing, ejecting, and reloading sequences. Students are able to hide and isolate any part – or group of parts – during the animation sequence, allowing for an unprecedented understanding of the mechanics behind the weapon. Digimation is known for its 3D graphics, so not only do the parts we create have accurate dimensions, they look real as well. In fact, our small arms trainers represent the state of the art in visual fidelity. This creates more compelling training and helps students more easily make the transition from virtual training to hands-on practice using the actual equipment. Book a DART demo and receive a full-working copy of the Visible Weapon program free.